I am no musician, but I know what I like, and the music I review will be songs that deserve to be played forever. 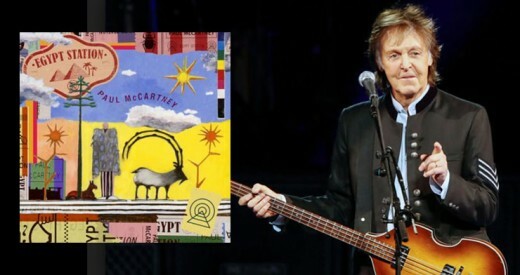 September 26,2018 Paul McCartney’s album Egypt Station hit #1 on Billboard Top 200. It has been 36 years since his last #1 album which was Tug of War which stayed #1 for 3 weeks in 1982. I was gonna say, you've been promoting the heck out of this album. You know, from James Corden… you really went the extra mile with him in Liverpool and taking the tour [of the city]. … I mean, you clearly really wanted to get the word out about the album. What made this album so special for you that you really wanted to go the extra mile and really get out there and kind of put the pedal to the metal? Well, you know, I think the difference is that we always do want to actually get people to know about it. 'Cause that's the thing. The worst thing is if people say, "Oh, you've got an album out? I didn't know." Before I purchased the cd I was hearing things on YouTube saying this album is not his best and not his worst, but somewhere in the middle. It made me wonder if I should purchase it, but thanks to Paul hyping this album I decided to buy it. I am so glad I did. This album sprinkles Paul’s sound from his days with The Beatles to his time with Paul McCartney and Wings. It is a beautiful album. Let’s explore all we can about all the songs on the album, and what inspired Paul to record it. What Inspired Paul McCartney to create Egypt Station? That is a cool way to create an album, but Paul has always had great ideas for his songs and his albums and he hasn’t lost his touch on this album. 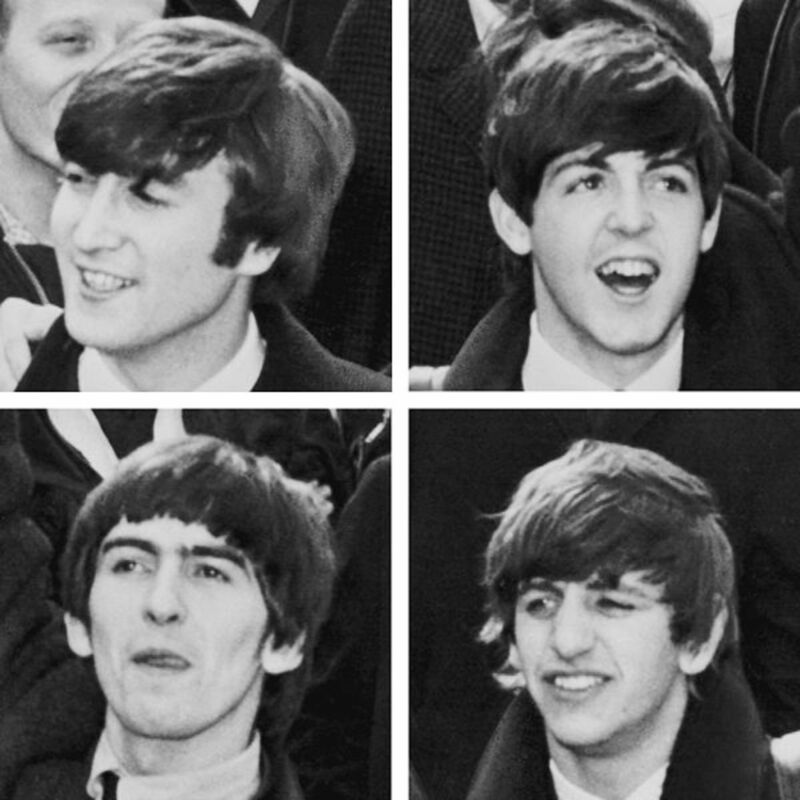 The songs on the album were partly inspired by 2017's 50th anniversary reissue of The Beatles' Sgt Pepper's Lonely Hearts Club Band. I remember going up to the studio a couple of times and saying, oh well I was listening to this programme last night and I thought on ‘Penny Lane’ it was just one piano that I played but it turns out it’s eight! We were goofing around on that, and it inspires you and makes you think you can go anywhere. It’s still gonna sound like a piano, but sonically you can play with it. Pepper was a big influence. How did the album cover come about for Egypt Station? According to BeatlesBible.com Paul McCartney used his own artwork for the cover. My original inspiration was similar to a picture we were talking about the other day, with Egyptian symbols and shapes I got from looking at a reference book on Egypt. I was interested in the way they drew sunflowers, so two appear on the left and on the right. It was a nice shape, so I took that and then I also love the way they symbolize trees. I like the way they reduce a tree to just some very simple symbols. 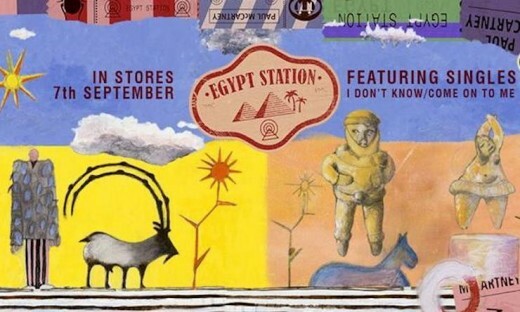 Elements of the original Egypt Station artwork can be seen in the cover art for the I Don't Know single. This is the beginning song for the album and according to Paul he visualized a station one could go to in order to hear songs. It is a beautiful sound starting with sounds of traffic, and then it is if the listener was being transported when a choir of voices appear. It sounds as if the listener is floating up to the clouds. Very cool. And sometimes that's a good way to write a song, 'cause you're coming from your soul. And we often used to say that writing a song was like talking to a psychiatrist, a therapist or something, 'cause you're saying it… you're saying it in a song rather than a room to a specialist. Yeah, so it was me just thinking this problem out, and putting it into a song. A great song to start off the album. This song will have you humming along. This song picks up the tempo and has Paul doing his rocking thing. This song is a toe tapper. It has a “Lady Madonna”, and “Junior’s Farm” sound to it which means you can’t go wrong. BeatlesBible.com has Paul explaining how he came up with the song. This song finds Paul being older and wiser and being happy to be with the people he loves. It has the sound of “Blackbird”, and “Little Willow”. It is also a song of how he appreciates all the great things in life. The beginning lyrics set the stage of his mindset on this song. With Who Cares I was thinking about a song where you're actually talking to the people who may listen to it. And in my case I was imagining the young fans, or just young people generally who might hear this, and who are going through some sort of problem where they're being picked on, being put on. These days it would be internet bullying, trolls and all that. In my school days it would have just been bullies and people just generally picking on each other. So I know that happens all over the world to millions of people. So my thing was to kind of try and help, try and help, almost give some sort of advice. So the song says, you know: "Have you ever been fed up with being bullied? Has this ever happened? With people who have called you names, who have done all these mean things. Has this ever happened to you? Well who cares?" And then the twist at the end of that chorus is like: "Well who cares? I do." It is great that Paul is trying to reassure the younger listener to try and hang in there and not to be bothered by them. Try and know that you have people that care about you. Paul brings the point home by these lyrics repeated throughout the song. Paul wrote this song in the studio with Ryan Tedder. They were bouncing ideas off each other. Paul said it was love song kind of raunchy one. It is meant to have the listener do a double take and take it the wrong way. It is the playful side of Paul it is almost as if he is winking at us and having us interpret the song any way we please. According to some sources the original lyric was to be “For You”, but the way Paul sang it, it came out sounding like “Fuh You”. I think Paul had this idea all along, and it was always the latter version not the “For You.” The melody of the song will stay in your head and so does the lyric. Paul has done it again. Paul is thinking of his younger days when he first started writing songs and playing the guitar was something he would do all the time. This song is a song about having your guitar as your friend. With the song Confidante I happened to be at home and I was looking in the corner where, propped up, was my old Martin guitar that I normally just have there, so if I feel like playing the guitar I'll take it down and play it or try and write a song or whatever you do. And I thought to myself: I haven't had time lately to play guitar. And it reminded me that, when we first got guitars years and years ago, it would be like a friend. It would be like a confidante: you'd go off into the corner, and you'd write a little song, and you'd sort of almost tell your troubles to your guitar. It's a love song to the guitar. How the guitar was my confidante, and I told you every secret thing and, in fact, unlike my other so-called friends, you stood beside me while I fought. And so it became a symbol of the guitar as a mate, as a friend, as a confidante. Paul McCartney sings the song wistfully and you can see him reflecting on those magical times when it was just him and his guitar as these lyrics state. 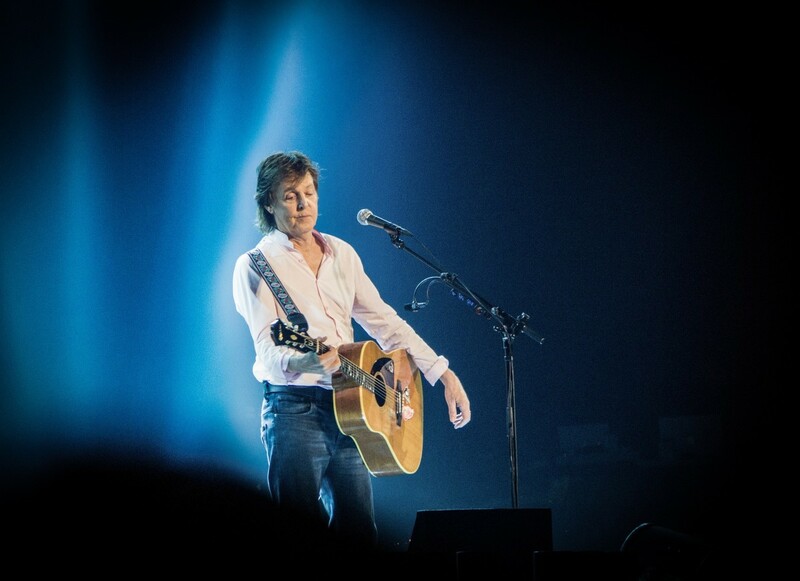 In this song Paul was inspired to write it when he played a concert in Israel. He then felt the urge to visit Palestine to show he cared for the people there too. This song is in the vein of John Lennon’s “Give Peace a Chance”, “Tug of War” by McCartney, and “All You Need is Love”. It isn’t one of the best songs on the album but who doesn’t want peace for all the world it is a great thought and hopefully one day all the world will find it. When Paul is singing a song with a prominent piano playing it is a special song. Here Paul is thinking of his wife and his second chance at love with her. It is a beautiful love song. TheBeatlesBible.com Paul explains how the song came to be. In Sometimes songs just come to you, sort of late at night. And I've got a piano at home, and in actual fact this particular piano happens to be my dad's old piano, so it's special to me. And I was sitting there one night and I just started to find these chords that are the beginning of Hand In Hand. And it's basically a love song. And as I wrote it, I was imagining me and Nancy about to go through life hand in hand. It was written [in the] early stage of our relationship. And then I started to think, 'Yeah, well, this is a lot of people.' You know, there are millions of people in that situation, where they've got someone they love, and they want to go through life hand in hand, and to be a partnership of some kind. And it was nice, actually, when we recorded it, we had two lady cellists. That's all there is on there beside the band. And it was very sweet 'cause at the end of it we liked what they'd done, we said that's great, thank you. And one of them sort of said, 'Oh, you know what? I'm getting married for the second time, and I'm a little bit nervous, but this song has made me think it's going to work out all right.' So we though, that's it! You know, that's a reason, right there, for writing that song. 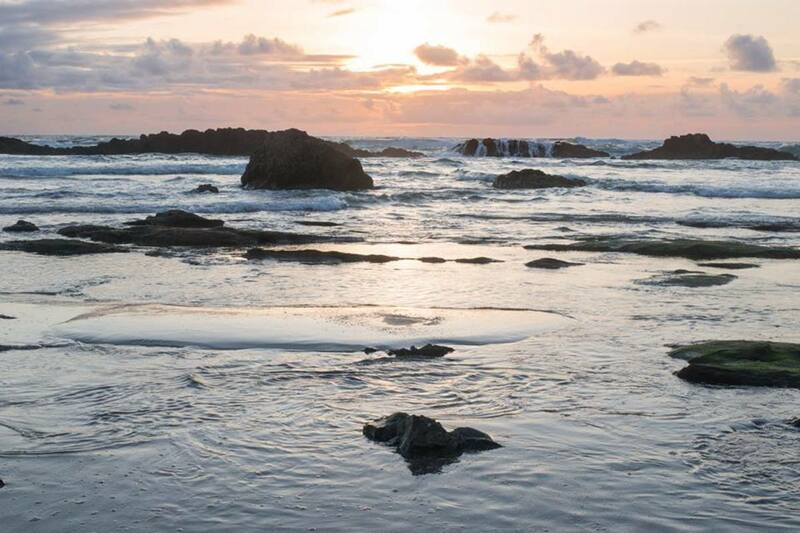 It is an inspiring song of hope for those who think love may never come again. This song shows how life is like dominoes life falls into place the way it should be, and things will be ok even if you don’t think so at the time. It is a great way to look at life and Paul has always had that optimistic twist in most of his songs that is heartwarming. This song just glides along just like life. Paul sounds like he has taken a trip around the world with this number. It is said he played over nine instruments on this song. It has a Sade sound to it. It is rhythmic and a song that will have you dancing. This song as a Wanderlust” theme to it. It is a song that sounds almost like it could be in a musical. Do It Now is an expression my dad used to say. Some songs don’t have to have any special meaning. This song is one of them. You know with a song title “Caesar Rock” it has to be a fun song. It reminds me of two songs by Paul “Don’t Say Goodnight Tonight” and “Monkberry Moon Dellight”. It is a perfect blending. In this song Paul shows he hasn’t lost his vocal power that much. This song jams. Paul turns political in this song. “Despite Repeated Warnings” is a song about global warming and politicians who refuse to believe it. I am not much for political songs, so this one is one of the weaker songs on the album. Paul disguises just what it is he is saying by making it a song about a sea captain who refuses to listen of warnings of trouble ahead and says full steam ahead. This song takes the listener back to the station it could be a bus station or train station or a radio station. It is an imaginary trip. I like how they wind things up by returning us to how it begin on our musical journey. Paul says at the end you hear someone plugs in a guitar at the station like he is a bus coming and collecting money. Pretty neat. Paul goes back to his rocking roots to end the album. It is reminiscent of “Band on the Run” with a three-part song. What is not to love about that? It was an idea that I fancied doing. I fancied doing it for a long time, of just getting someone – it turned out to be me – I was just going to get someone to play blues guitar against an orchestra holding a chord. In this case it was C, and then C minor, just the orchestra hold this chord for ever and ever and ever, and then this guitar playing over the top of it. And that finishes the album. Right at the end of that session… you just hear a little 'Whoo!' and that's it. This song is a great way to end the album. Paul is still enjoying creating his music and the span of time hasn’t diminished his creative juices. 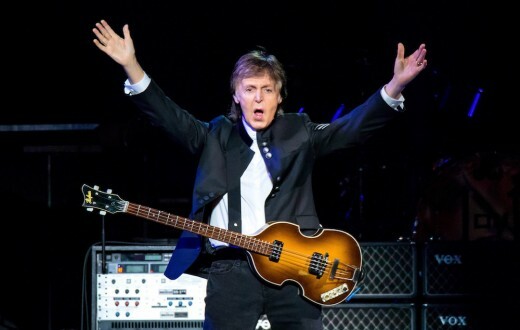 Paul McCartney will no doubt be celebrating his success at the top of the charts. He proves that age is just a number, and talent is all that matters. Sir Paul McCartney has plenty of that to spare. Egypt Station is worth the imaginary journey to visit repeatedly. Jeff Lynne and Paul McCartney - About the Best Musicians of the Late 20th Century. Why?